This is the third year that I’ve participated with COMOM – what a GREAT event! 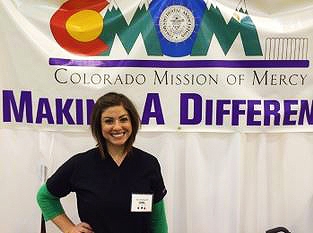 COMOM is a giant dental clinic that is set up annually in different Colorado communities. Hundreds of dentists, hygienists, assistants, and lab technicians volunteered dental services to over 1,200 people who otherwise wouldn’t be able to afford dental care. Patients underewent dental procedures amounting to over $1,000,000 in donated care. Patients start lining up about midnight the night before and wait in line all day for dental care. It’s fulfilling taking care of so many people who otherwise would not receive oral healthcare as well as a fun day working along side local dental colleagues.